I'm having so much fun hand piecing this quilt that I'm zipping along. Here I'm working on baggie #10. All the individual blocks for 12 rows are done and I'm working on the half blocks to fill in. Of course I still have the connecting to do. My mom and dad made a trip to Japan in the 80's, getting to travel the "back roads" and visit in homes. 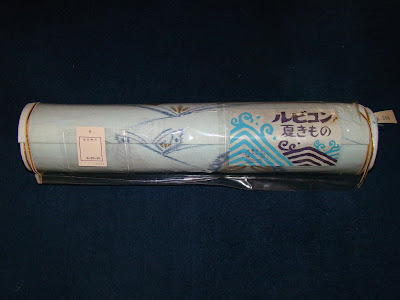 Mom bought me this roll of fabric but I never could figure out how to use it in a garment. I got to thinking about what I will use for the border and remembered this wonderful gift. There's plenty and fits in with the colors and theme of this quilt. My only regret is that Mother isn't here to share in the joy of designing and making of my quilts. 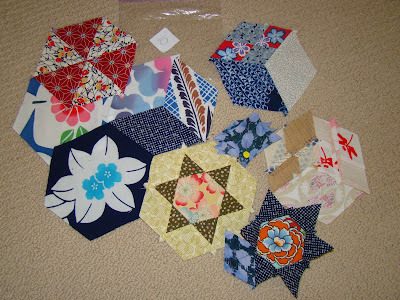 Your hexagon quilt is coming along splendidly! Can hardly wait to see it. 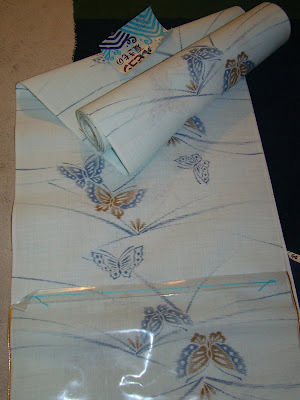 And the fabric you will be using for the border is absolutely perfect and so beautiful! I am sure your mom would be so pleased that it will be used just exactly as it should be. Things kind of have a tendency to fall into place. Hexagons are looking good. Just love the roll of fabric. It will be perfect for the border. quit it. youre making me cry.